Easter is celebrated on Sunday April 21st this year. It is a Christian holiday that celebrates the resurrection of Jesus Christ. The resurrection is said to have taken place 3 days post crucifixion. Traditions include a period of fasting known as Lent. This begins on Ash Wednesday and lasts for 40 total days (Sunday’s excluded). In the USA families gather and have Easter dinner together and often exchange gifts from the older generation down to the younger of candy, toys, bibles, and even gifts such as gold crosses and rosaries. In the 19th Century the Easter Bunny worked his way in to the tradition as well though it has nothing to do with the original celebration. Legend has it that the Easter Bunny lays, decorates and hides the eggs to symbolize new life. Along with Easter, in sections of the Spanish community, Semana Santa is celebrated. Semana Santa’s dates change yearly. This year, in 2019, it runs from April 14th to April 20th. This is what is known as the Holy Week in Spain. Originating back to the middle ages and well celebrated in the Baroque period and in to the 20th and 21st centuries. The celebration is held within the Spanish Roman Catholic community and centers around family and tradition. Though mainly celebrated in Spain, those of Spanish decent often carry over the traditions here in America. In Spain it has become not only a tradition of the religions followers but also a tourist attraction and social event. Many visitors who are not from Spain travel to see the beautifully done parades. They are well covered by local TV stations and local guides are given schedules and details so that they may lead their tours to include the festival and festivities. The Holy Week has been depicted in music, literature, paintings, and in movies. A favorite dessert during the Holy Week is a rice pudding known as Andalucia as well as torrijas (slices of bread which has been egg dipped and soaked in wine or milk, then fried and sprinkled with sugar and cinnamon. When celebrated in Mexico often the celebration will include an elaborate reenactment of the trials, tribulations and eventual crucifixion of Jesus. Samana Santa is a robust, colorful, and meaningful celebration. Those participating in the parades generally wear dramatic costume like robes or military uniforms. Overall Semana Santa is a colorful festive beautiful ceremonial appreciation for Christ himself and for the overall religious themes that play out. The fact that the festival spans several days allows families to celebrate from home to home and with many. Much like Easter, during Semana Santa gifts of gold, money, or candy are also given to the children in the family. 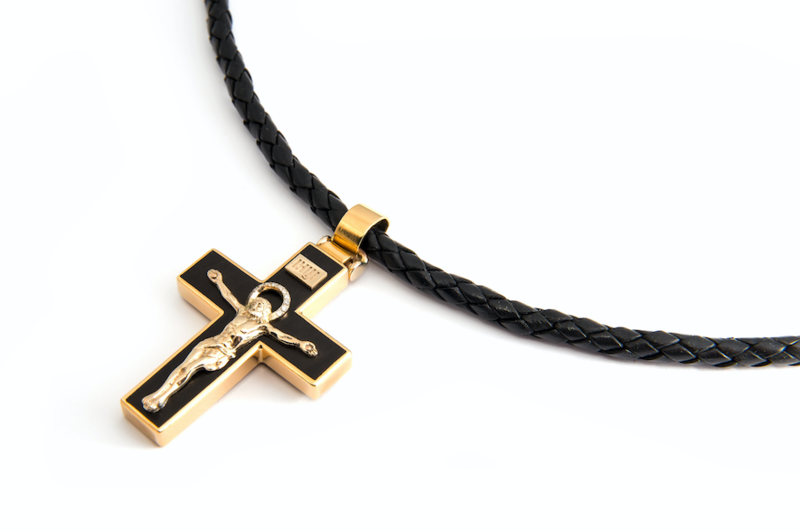 If you are shopping for beautiful gold crosses come in to First Pawn, we may just have the right gift for Easter or Semana Santa.